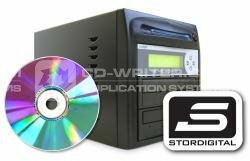 With Pioneer CD/DVD writers in your StorDigital duplicator, you can be sure you are purchasing top quality components with writers that deliver perfect copies time after time. Ideal for the user who needs to create and duplicate their own DVD movies, or put together digital photo presentations and slideshows, burn music CDs or backup data files onto DVD-R, DVD-RW,+R and +RW, CD-R and CD-RW discs with ease. The Pioneer burner is top of the range. It's quiet in its operation; extremely fast and very reliable with a range of capabilities including CD-Text and CD+G. This is a SATA connected writer that has a 2MB buffer memory and is capable of achieving 24X Write speeds with DVD+R/-R blank media. You can duplicate 8cm discs as well as 12cm disc formats.